Daniel Krupa, 20, was arrested for scuffling with security and other rowdiness, police said. COOK COUNTY CRIMINAL COURTHOUSE — A judge told a suburban man to stay away from Wrigley Field after allegedly getting rowdy, mouthing off to ballpark security and scuffling with guards at Sunday's game. 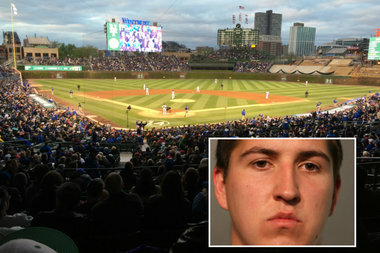 "You can't go to Wrigley Field this summer," Cook County Judge Adam Bourgeois Jr. told 20-year-od Daniel Krupa of Lemont. Judge Bourgeois released Krupa on his own recognizance and set a special condition of bond banning Krupa from Wrigley Field. The ban will be in effect until Krupa's case is resolved.